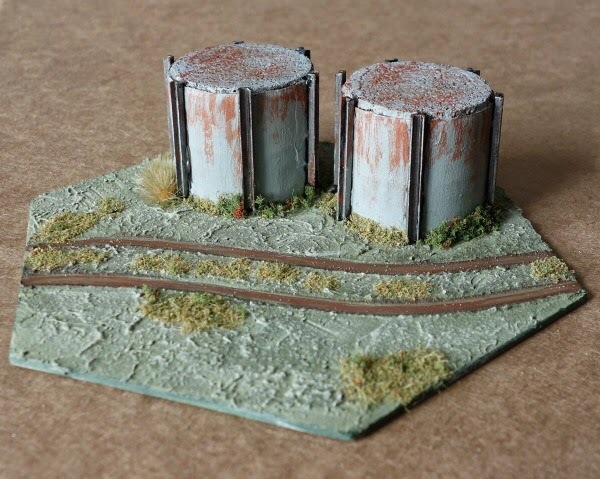 Having a few bespoke hex based scenic pieces can really visually enhance a hex layout without being too expensive. A quick hunt around a model shop can add some useful items to the modellers 'odds and ends' box, but the real treats can come by converting some everyday items that are 'cheap as chips' - if your eye can recognise the modelling potential. This post is just going to look at a few eye-catching bases that have been put together for just a few pounds, with some surprisingly good finds from the local shops. Please click on the 'read more' tab for the rest of this post. First up is the brick furnace piece. A few years ago at a show, I saw a tumbled down brick chimney in 20mm for an east front game and it look superb. Wanting something similar for the 10mm boards, out came the Milliput and disaster. 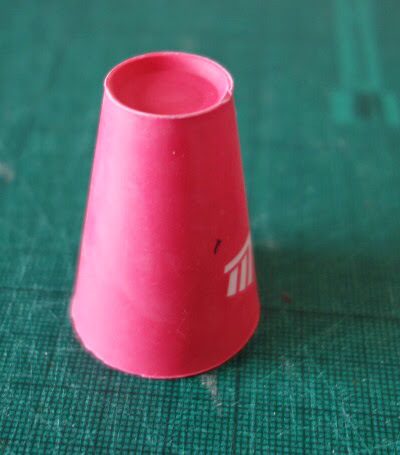 I found it too difficult to manually get an accurate uniformed cone shape. They are made from a rubber type material, which gave some early worries about them flexing and the modelling paste falling off, but I thought it was worth a try anyway. The large pink one looked rather chimney like (or even windmill like for the adventurous). It was washed in warm soapy water and roughened with a light rubbing of sand paper. The very top part (the bit the ball sits in) is quite thin and flexible, so to make the tower rigid, a small square cube of balsa wood was pushed up inside against it, set with silicon (the stuff used as sealant for sinks and windows), though I imagine an old dice set in glue would work just as well. To keep the whole tower rigid, a 5p coin was glued in, that went about half way up where it became a tight fit and a 2p coin was glued into the base, which was a nice snug fit. Washers would do just as well. The piece was glued down onto a blank hex template with a general purpose contact glue. The base was a 2 hex (Kallistra) blank template cut down into two singles, so each single base works out at just 50p. To give the chimney stack some company, small off cuts of foam board were used to make an integrated building and their edges were chamfered so that they properly mated with the sloping sides of the chimney. This would be a flat roofed building with the roof cut from a thin piece of balsa wood, likewise shaped to mate with the chimney. Thick PVA glue got all the bits locked into place and the glue between the building and the chimney was laid in thickly so that a seal would form where any gaps existed, making them easier to fill later. A wooden matchstick was cut into slivers to make a door frame. With this being a kiln / furnace, I decided against windows in the building or having any plants and grass too close to the chimney itself. PVA glue went onto the flat roof and it got a light sprinkling of tarmac coloured flock, which once dry was dry brushed grey. With hindsight I think at this point the rubber chimney should have been coated with PVA glue for the same reasons that soft plastic figures get the same treatment, but instead, it just got a coat of standard brush on black primer. To make the whole thing look like a red brick structure, some filler paste was mixed with venetian red paint and a drop of black paint to make a thick mix that could be brushed on with a 10mm flat brush. The building was done first, doing one wall at a time. The mix went on thickly and brushed out evenly and then the tip of a palette knife was pressed into the paste to suggest brickwork. The chimney got the same treatment, doing the lower half and then the upper half in quick succession while it was all wet. In a few places, the primer came away and I had bits of day-glo rubber showing through, winking at me! and this is where I think coating it in PVA first might have helped. There is not much you can do about that except let it all dry and then go in with a repair mix. Once dry, the whole thing was given a mucky wash (an empty Games Workshop paint pot half filled with water with three drops of black acrylic paint and 4 drops of strong brown acrylic ink added). This got into all the cracks and helped define the bricks. This effect was enhanced with a dry brush of lightened venetian red. 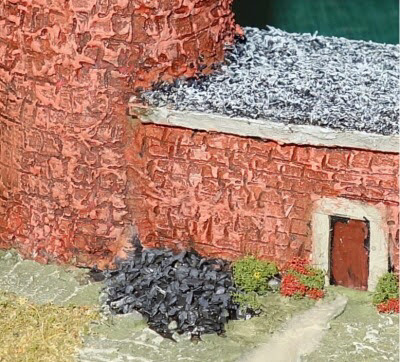 Two piles of coal were placed nearby and the exposed base was given a textured coating using filler paste mixed with green acrylic paint (cheap artists paint in a tube) and a drop of black paint and a pinch of old course flock for texture. The pathway was dragged into the wet paste and when dry, all the ground work was given a generous mucky wash. Finally the base was dressed with some fine turf and flocks. 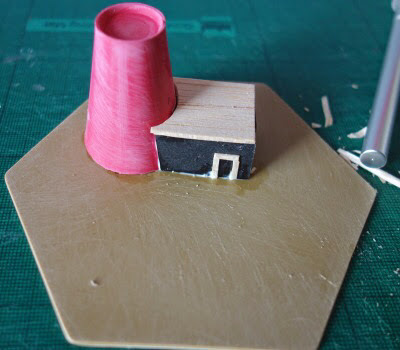 It's hard to put an exact price on the base because most of the materials were already owned, but if we say £2 for the chimney, 50p for the base and another 50p for everything else, then we haven't done too badly for our £3. 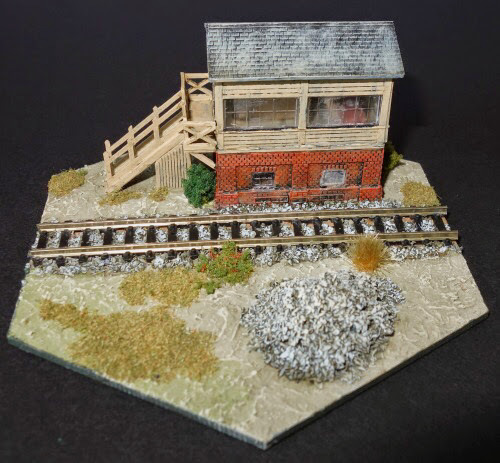 I have pieces of 'N' gauge track mounted on balsa wood strips that are used as plonk down wargame terrain and I wanted a piece the could help unify these lengths of track in an interesting way on the hex grid. 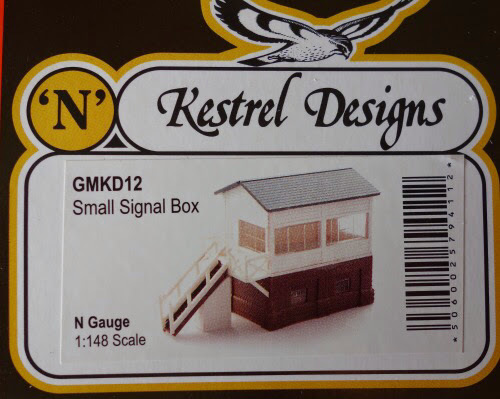 While in the model shop a plastic self assembly kit from the Kestrel Designs series (produced by Gaugemaster) was spotted. It cost a little over £6 and looked like it would be small enough to sit next to some track on my 4" hex and still allow figures to also be in the hex. Made from white and brown plastic parts, it looked rather bright and stark in the picture on the packaging. Even inside the cabin was bright, empty and consequently very bare looking. 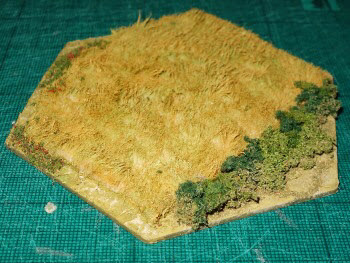 This would need some 'knocking back' for it to quietly blend in with my other terrain. 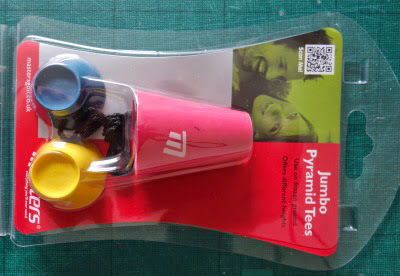 The kit is easy to put together and it takes the plastic cement really well. In an effort to get rid of that bare interior look, I glued a brown wooden block inside (from a Commands and Colors boardgame) and painted some dials and buttons on it. A small square block of balsa went in at one end with split cocktail sticks being pushed into the block so that they looked like track levers. Because none of this looked very realistic, I put some glue (plastic cement) smudge marks on the inside of the glass, that substantially frosted the windows and all the blurry shapes actually started to look quite good. (note - it sounds like a special trick, but since I always manage to get glue on plastic windows whether deliberate or not, we should perhaps just think of this as a happy accident!). The assembled signals box was mounted onto a 10cm (4") wooden hex template (Pendraken) and pushed right over to one side, so that the track could lay next to it. The lower half was painted brick red, the upper half and stairs etc in a 'planking' colour and the roof done out as slate grey. The whole thing was treated to a heavily applied mucky wash, brushed off to avoid pooling. The track came from a saved off-cut from the track pieces made a few weeks previously and this was glued directly onto the board, so that it would mate with the other track sections that were already raised on balsa wood that roughly shared the same depth as the Pendraken MDF hex template. The model shop sold two types of gravel, heavy and fine. 'N' Gauge is better suited to the fine gravel. PVA glue was carefully brushed in between the sleepers and around the ends of the sleeprs and then the fine chippings were sprinkled on, pressed down and then the loose ones tapped off. 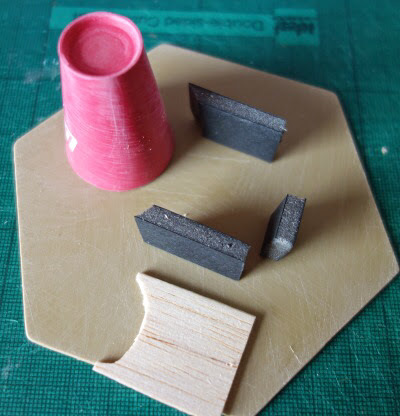 A few sections of the plastic sprue that had held the model signal box were glued onto the base in a small stack and when dry, a mix of gravel, black acrylic paint (just a drop) and PVA glue was pushed down into and onto this sprue frame. It formed a stone pile (which is actually nicer looking and much more 3D looking than this photo shows) with some of the mix falling down internally between the gaps formed by the sprue, so that the whole thing locked together when dry. As with the furnace piece, the base was dressed with paste and fine flock. All told, it makes an attractive item on the table and really enhances the length of track. The total cost for the base would be a fraction over £7 with most of that being for the building. Oil / Gas storage tanks. While in Wilko's (UK store), I saw the ideal 'bits' for the gas tanks that I had wanted to build for my Stalingrad project. Six of the black rubbery (self adhesive) floor protectors when stacked, formed the right dimensions for a single tank (so you can make 3 tanks to a pack). They also sold cork protectors which can be used to smooth off the top of the tank. The cycle caps shown were also bought with a view to doing a silo or having some machinery in a half ruined building etc. 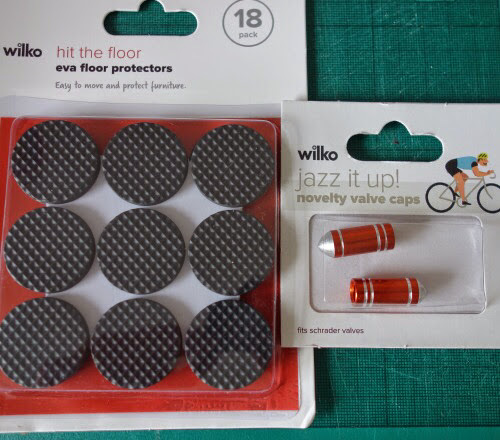 The floor protectors were £1, the cork protectors £1.50 and the cycle caps £1.50 so enough to do the job and have some spares for the odds and ends box ..... or real jobs in the house! Six protectors were stacked, topped with a cork protector and then wrapped in a short strip of paper fully coated in PVA glue, so that the disc shapes were concealed but their shape still slightly showed through the paper giving a metal panel effect. The runners for the sides of the tanks are from a length of plastic rod sold at the model shop. They are 'U' shaped, which helps give the tanks some realism as they look like metalwork. 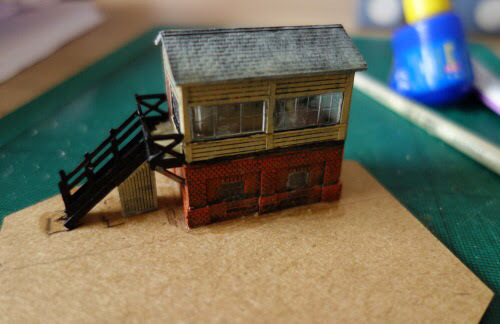 The shop also sold plastic gantries which I bought to customise some of my ruined buildings. This is quite an easy scene to do. Two tanks are adequate for an appealing scene. They can be set to one side of the hex template (Kallistra), leaving plenty of room for units. They are painted a light bluey grey which will darken when the mucky wash goes on. Some weathering in the form of dry brushed vanetian red gives a rusty look and some of this can be pushed into the runners. I had all sorts of ideas for pipes coming out of the tanks etc, but it just seemed to make the scene look too contrived. As above, the paste went down on the ground and two track marks were dragged across the wet paste to provide interest. Flocks were used all around the base of the tanks as it knitted them to the ground and added to the weathered look. Again for just a few quid we have got ourselves a pleasant piece that helps break up the board without shouting too loudly 'look at me'. The following pieces have already been seen in games shown here, but they fit within the theme of the post so are worthwhile re-visiting. These must be the cheapest things to put together as most people doing terrain will already have the parts. You are just buying the hex template. Surely these can't even be costing as much as 75p a tile. I gave the tiles a slight sanding and then covered them with PVA glue. 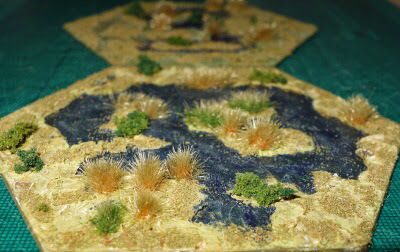 This is done carefully because the texture of the drying glue will be seen in the water parts of the completed piece, so avoid leaving big streaky tracks of glue and do plenty of light short cross brushing strokes. The paste was applied in a way that left clear areas for pools and the pools were painted blue. Everything then gets a heavy coat of mucky wash, especially the water. A very gentle dry brush will bring the texture of the PVA glue to the surface of the water, so that it suggests vegitation just below the surface level. Once dry the water can be selectively varnished in either gloss, satin or matt, depending on your preference to the end look and how it might match your current waterways. The rest is easy, just dress with flocks, grasses and bushes. In future it might be better to cut the fur back with an electric razor rather than scissors for a more consistent finish. It is harder than you might think to get colour in there, especially as acrylic paint is meant to easily stain fabric. The fibres probably have a closed resistant surface. Anyway, scrubbing the colour in with the brush seems to get there in the end and as it thickens and clumps some of the grass, that 'teddy fur' look reduces. It helps to try and make the fields look a little different from each other. This one is a two hexed field with a bit of decaying fencing at two of the edges. There are a multitude of things that can form a theme for one of these bases and they don't take up much storage space. My next scenic tile will be a parade square for my Stalingrad games. This will be a simple piece with an upright block in the middle of the hex and a 15mm figure in a suitable heroic pose perched on top. This will be painted a weathered bronze colour (so I even get out of doing a posh paint job). For the 10mm scale it should look about right. As an aside, my hex based ruinous city scene, is at last ready for sharing. It has turned out rather well and hopefully should be the subject of the next post. 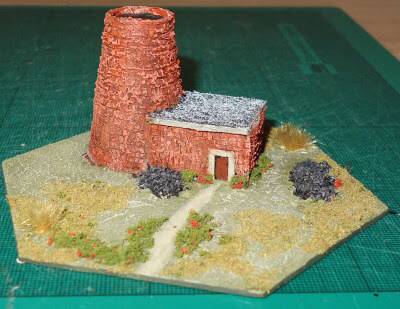 Great results - the chimney scene works very well and the marsh area look good. Thanks, I suppose I should have stressed that I am neither a modeller or a particularly patient person and so it seems to me that these sort of things can be knocked out by most people, so I hope the post help encourage readers to have a go. I have spent many years feeling that 'homemade' stuff just looks homemade, but these days I feel that it has a charm of its own and it gets me back to my very early wargame roots in which basically you had to make everything yourself. There seemed to be an innocence in my early years of wargaming that somehow has got lost over the years as we have all become more sophisticated in our mindset and things around us are more professionalised. Though I have moved on from trees being made from matchsticks with cotton wool glued on the top half and wetted with green poster paint!